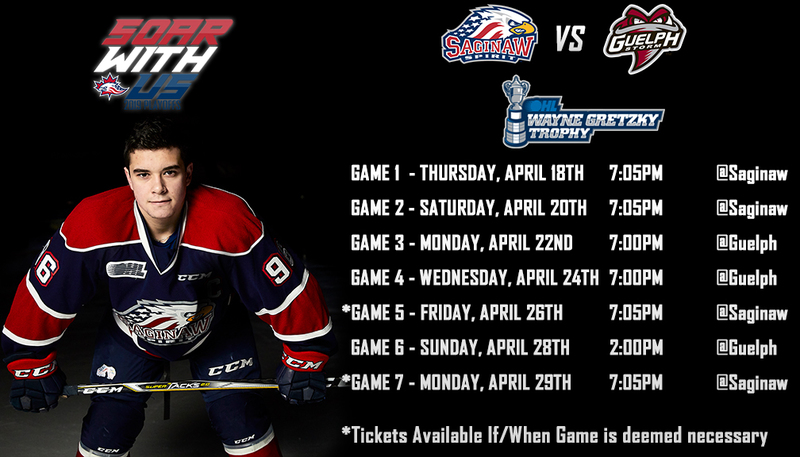 Saginaw, MI – The Saginaw Spirit host the Sarnia Sting in the first round of the OHL Playoffs tonight at The Dow Event Center. Thursday marks game one of the seven-game series between the West Division rivals. Saginaw yields home-ice as the two seed in the Western Conference. The Spirit clinched a berth in the playoffs for the 13th time in 14 seasons, and look to get past the first two rounds for the first time in team history, with this year being their most successful campaign in the team’s 17-year history. In the six-game regular-season series, the Spirit and Sting each won three games, with Saginaw taking a 6-2 road decision on March 12. As the OHL West Division champions, the Spirit clinched their second Bumbacco Trophy in franchise history and first since 2011. 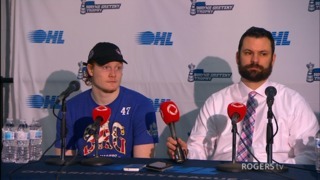 It’s a fitting accomplishment to what was a year in which Saginaw won a franchise-high 45 games with 34 coming under the guidance of head coach Chris Lazary. 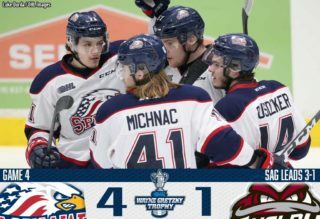 Finishing the season at 45-17-3-3 with 96 points, the Spirit lost in regulation just eight times since Lazary was promoted back in late-November, coming three points shy of the London Knights in finishing on top of the Western Conference standings. Much of the team’s on-ice success correlated with their activity during the trade deadline in January, acquiring the likes of Owen Tippett, Ryan McLeod and Justin Murray, who were considered to be the final pieces for a deep playoff run. Saginaw also saw the emergence of Cole Perfetti, Bode Wilde, Cole Coskey and Ivan Prosvetov. Perfetti, the 2018 OHL Priority Selection first-round (5th overall) pick, finished first among all league rookies in goals (37) and points (74). Coskey was the team leader in goals (31) and points (63) before going down to injury in mid-February. The Zion, Illinois, native is hopeful to return at some point in the playoffs. Wilde, the 2018 New York Islanders second-round (41st overall) pick, yields the third-highest goals (19), assists (51) and points (70) total among OHL defensemen this season. The Plymouth, Michigan, native is also first for Saginaw in assists and third in points. Prosvetov, the Arizona Coyotes goaltending prospect, appeared in 53 games for the Spirit after being taken in the first-round (18th overall) in the 2018 CHL Import Draft. Prosvetov is currently ranked in the top five among league goalies in wins (36), goals-against average (2.94) and save percentage (0.910). When Saginaw lost to the Sault Ste. Marie Greyhounds last Thursday in overtime, which guaranteed the West Division title with the one point earned, it ended a nine-game winning streak which was an all-time franchise record. On special teams, the Spirit have the league’s 10th best power play unit on 51 goals for a 22.5 percent success rate this season. The penalty kill is ranked third overall with 60 goals allowed for a 77.9 percent success rate. The Sting sneaked their way into the playoffs as the seventh seed after a two-week long positioning battle with the Windsor Spitfires and Erie Otters. At 28 wins, 33 losses, five overtime losses and two shootout losses for 63 points, Sarnia has clinched a playoff berth for the fifth straight season, falling in the conference semifinals last season at the hands of the second-seeded Kitchener Rangers, last season. In three visits to The Dow, the Sting won once back on Septemeber 22 in what was Saginaw’s second game of the regular season. 2017 CHL Import Draft first-rounder Hugo Leufvenius leads the team in goals (37) and points (81), this year. Toronto Maple Leafs prospect Ryan McGregor maintains a club-high 52 assists. Cameron Lamour, the former Spirit draft pick in 2016, has compiled a goals-against average (GAA) of 4.99 with a 0.852 save percentage (SAV%) in 20 appearances with the Sting since being traded last December. On special teams, Sarnia is ranked ninth in the OHL on the penalty kill this season with 41 goals allowed for an 85.7 percent success rate. The Sting also have the 13th-best man-up unit with 56 goals scored for a 20.1 percent success rate. There will be a combined 10 players on the ice Thursday with their rights owned by NHL teams. For the Sting, it’ll be McGregor (Toronto) and Mitch Eliot (Vancouver – signed as a free agent). 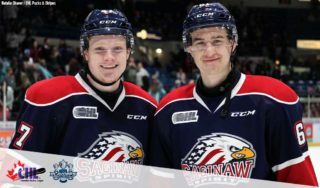 Reilly Webb (Detroit), Brady Gilmour (Detroit), Damien Giroux (Minnesota), Blade Jenkins (NY Islanders), Prosvetov (Arizona), Tippett (Florida – signed), Wilde (NY Islanders – signed) and McLeod (Edmonton) will represent Saginaw. The Spirit take on the Sting in game two of the seven-game set Saturday at The Dow. Puck drop is scheduled for 7:05 p.m. (EST). The series will move to Sarnia for two straight games next Tuesday and Thursday before heading back to Saginaw for game five on Saturday, if necessary.